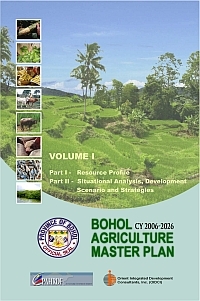 The Provincial Government of Bohol in partnership with the Philippines-Australia Human Resources Development Facility (PAHRDF), through the technical assistance of Orient Integrated Development Consultants, Inc. (OIDCI), crafted the Bohol Agriculture Master Plan (BAMP) 2006-2026. The master plan consists of four (4) major productive components, namely: Sustainable Integrated Agribusiness Project (SIAP); Livestock Integration for Food and Enterprise (LIFE) Project; Fishery Resources Development and Management (FRDM) Project; and Natural Resources Development and Management (NRDM) Project. The plan is in 4 Volumes: Volume I – Resource Profile, Situational Analysis, Development Scenario and Strategies; Volume II – Programs and Projects; Volume III – Annexes; and Volume IV – Executive Summary. 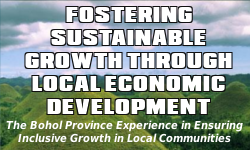 The plan identifies a two-point strategy for achieving the goals of productivity and self-reliance through food security at the household level and agri-industrialization and serves as a blueprint to guide future direction and growth of the province agriculture sector. The links to the BAMP seem to be broken. Do you have any links where I can access the BAMP? Hi Joseph, thanks for your interest of Bohol’s development plans. The links to the different volumes of the BAMP are working fine. Perhaps your browser attempts to open the PDF files instead of downloading the file. That would take a while to open, especially if you’re on a slow internet connection because these are huge files. It would be better if you RIGHT-CLICK on a link then choose “Save Link As” or “Save Target As” or anything to that effect, the context menu depends on your browser. This action forces your browser to download the file instead of opening it directly. Actually, downloading or opening the file takes the same amount of time because either way your browser will have to download the file first before opening. It’s just downloading provides you with information on your download progress, while opening does not and it seems like nothing is happening which will lead us to think the link is not working. I have the same problem with Joseph. Tried saving the files but it didn’t work. Hi Yan, can you expound what happened when trying to save the files? Did you try the methods I suggested to Joseph in my reply? We want to understand what didn’t work. Did something prevented you from downloading the PDF file? Did the download completed or not? Was the download completed but you are unable to open the PDF? I’ve tried all 4 links myself on different browsers and now from different computers and yet I didn’t have those problems. The links work very well. Just to say that there is no problem with downloading the files. Maybe its the strength of internet connection of Joseph and Yan that made it difficult for them to download the files as these were quite heavy.